This great stamp set is ONLY AVAILABLE FROM JULY 1st – 31st for ONLY $5 with any order of $60 or more (before s/h & taxes) – in your choice of either wood or clear mount!! What a deal!! And here’s the ‘For You’ card I made. I had made it for one of my son’s teachers (one of the perks of being a SU! demonstrator – I got to order mine early!) to give with a year end gift. Recipe: Whisper White card base; 1st layer: Cherry Cobbler card stock, embossed with the ‘Polka Dots’ embossing folder; 2nd Layer: Whisper white card stock, stamped with the ‘A Reason to Smile’ large flowers in Raspberry Ripple (back 2) and Primrose Petals, the smaller flowers in Raspberry Ripple, and the leaves are from the Papaya Collage stamp set. I ‘bunched’ the 1/2″ Scallop Dots Ribbon in Cherry Cobbler across the bottom, and popped up the ‘For You’ sentiment on dimensionals. The sentiment I stamped with the new ‘Layered Labels’ stamp, and die cut it with the matching ‘Apothecary Accents Framelits Dies’. I tell you – I love the framelits that match the stamp sets!! It makes stamping and cutting so quick, and so professional looking! 🙂 To finish off the card, I adhered 3 small pearl accents in the left corner. 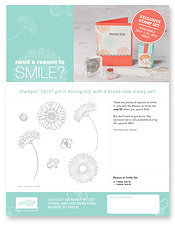 Get the Reason to Smile Set-up to a $25.95 value-for just $5 when you spend $60 on any Stampin’ Up! products. *Enter the $5 item number after reaching $60 on your order. You HAVE to key in one of the above Item Numbers, in order to get the set for $5.00 (if you’re placing your order online yourself). Or, call me to place your order – I’m happy to do that for you! I hope you’ve enjoyed today’s card and promotion! I may not be back tomorrow (my BFF’s birthday celebration) but I’ll see you on Sunday! Previous Previous post: I’m Back – with New Creations! Cute card! I bet the teacher loved it. I'm now following you from SC and hope you'll follow me at http://goinovertheedge.blogspot.com. Beautiful card!! My Reason to Smile set just arrived Friday, and I can't wait to play with it. I just love what you've done with it. Thanks for the lovely compliment, Brenda! I can't wait to see what you design – I love your work! Ooooh, such a pretty card! I do love this year’s new In Colors! Love the way you overstamped the cards and pleated the ribbon. Thanks for posting your gorgeous card! I’m so glad you like it, Laura! 🙂 Thanks for taking the time to comment – I do love to read them!